The 1960s saw this neighborhood develop a Latino presence, and this became its Main Street. The storefront at 3161 Mt. Pleasant Street once housed Casa Diloné , the first bodega (grocery) here. From 1962 until 1998, Casa Diloné sold products familiar to immigrants and embassy staffers from Latin America and the Caribbean who lived in the area. It was a social center for Washington's Spanish-speakers and attracted other Latino-oriented businesses. Mount Pleasant was known for its Salvadoran community. In fact, campaigning for Salvadoran elections became a regular event here. In 1990 Salvadoran émigrés Haydee and Mario Alas operated Trolley's Restaurant where, 20 years earlier, customers had lined up out the door for the Loop Restaurant. In 1974 the activist, ecumenical Community of Christ church moved to 3166 Mt. Pleasant Street from Dupont Circle. Many congregants, dedicated to a simpler and more communal existence, moved here as well. 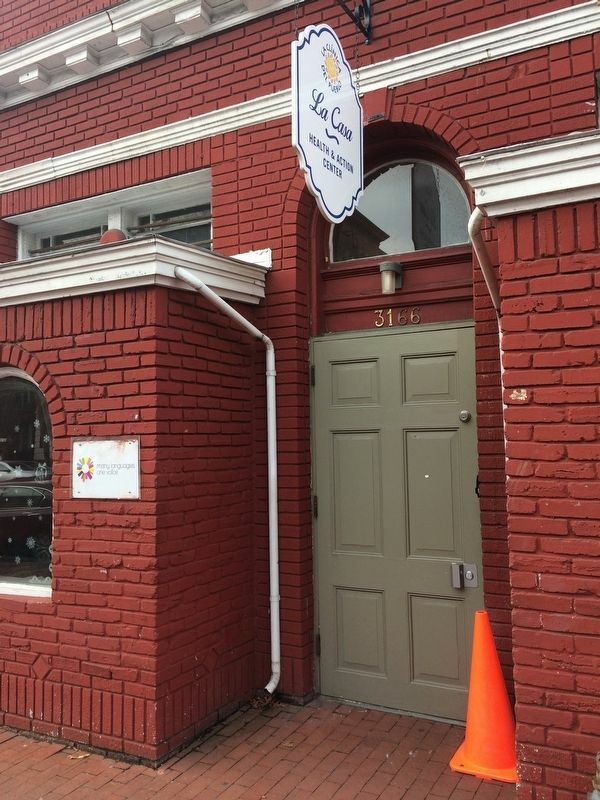 The group's La Casa provided space for community activities and the Life Skills Center, founded by a church member. Tucked into a bend in Rock Creek Park on the breezy heights above central Washington, Mount Pleasant was one of the city's earliest suburban developments. It began as a village of government clerks mainly from New England, and stretched from 17th Street east to Seventh Street. Later it attracted prominent citizens to its site along fashionable 16th Street, and eventually yielded the area east of 16th Street to Columbia Heights. But that's only on the map. Mount Pleasant's boundaries depend on who you are and where you came from. 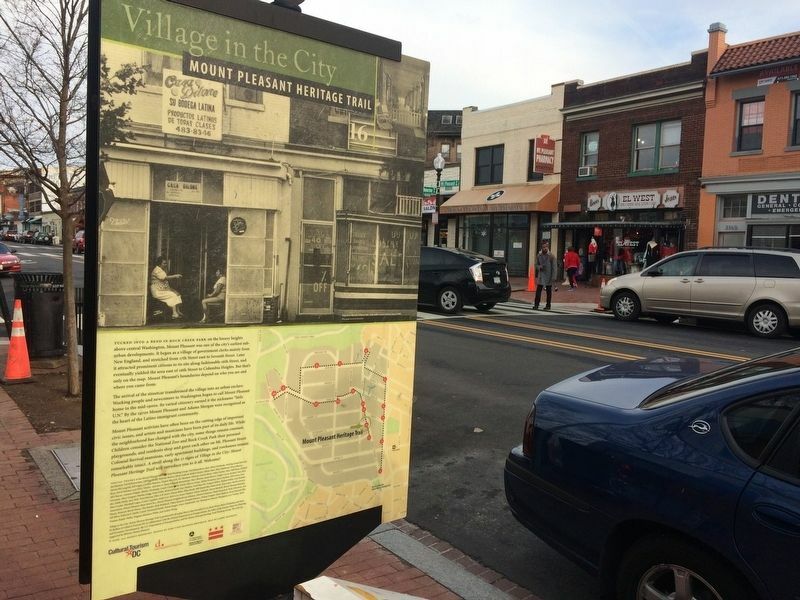 citizenry earned it the nickname "little U.N." By the 1970s Mount Pleasant and Adams Morgan were recognized as the heart of the Latino immigrant community. Mount Pleasant activists have often been on the cutting edge of important civic issues, and artists and musicians have been part of its daily life. While the neighborhood has changed with the city, some things remain constant. Children consider the National Zoo and Rock Creek Park their personal playgrounds, and residents shop and greet each other on Mt. Pleasant Street. Colonial Revival mansions, early apartment buildings, and rowhouses remain remarkably intact. 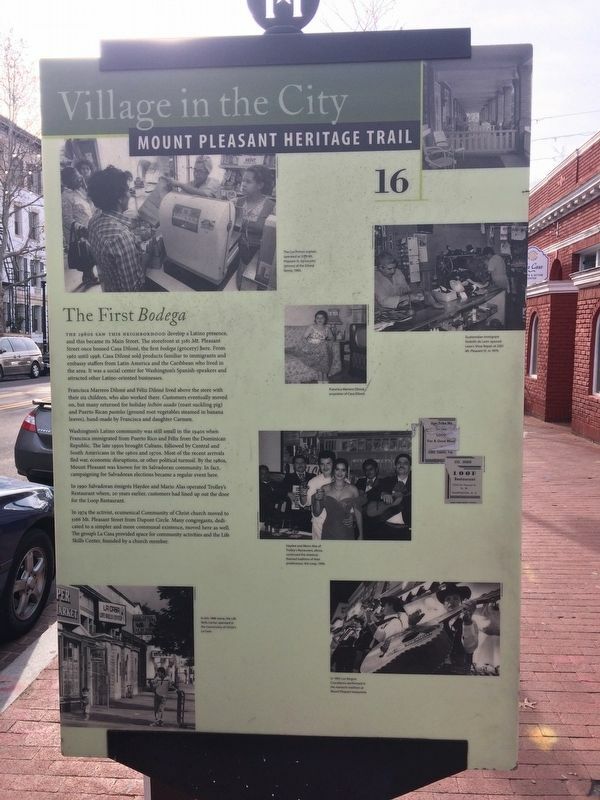 A stroll along the 17 signs of Village in the City: Mount Pleasant Heritage Trail will introduce you to it all. Welcome! Sharon Deane, Malini Dominey, Larry Fredette, Will Grant, Joan Graumamn, Mary Gregory, Martha Grigg, Tony Grillo, Richard Hardy, Faye HAskins, Fred Haya III, Gregory Heller, Michael Heller, Luis Hernandez, Eddie Hicks, Jane Holt, Toni Johnson, Eliza A.B. Jones, Wayne Kahn, Ellen Kardy, Bill Katopothis, Brian Kraft, Ken Laden, Myrtle Lawson, Mary Leckle, Marshall Logan, Louise Legsdon, Linda Low, Rob Low, Jeanie Majeed, Gladys Mitchell, Gloria Mitchell, Mount Pleasant Business Association, Mount Pleasant Main Street Inc., Mount Pleasant Neighborhood Alliance, Michael Najarian, Mark Opsasnick, Ruby Priecanos, Ann Piesen, Rosanne Burch Piesen, Wes Ponder, Rick Reinhard, Vilma Rosario, Donald Schwarzz, Wosley Semple, Chris Shaheen, Ryan Shepard, Harold Silver, Kathryn S. Smith, Louise Townsend Smith, David Songer, Grace Tamborrelle, Fay Thompson, Honora Thompson, Leu Vondas, Tasso Vondas, Randy Waller, Dagmar Hasalova White, and Arthur Wong. 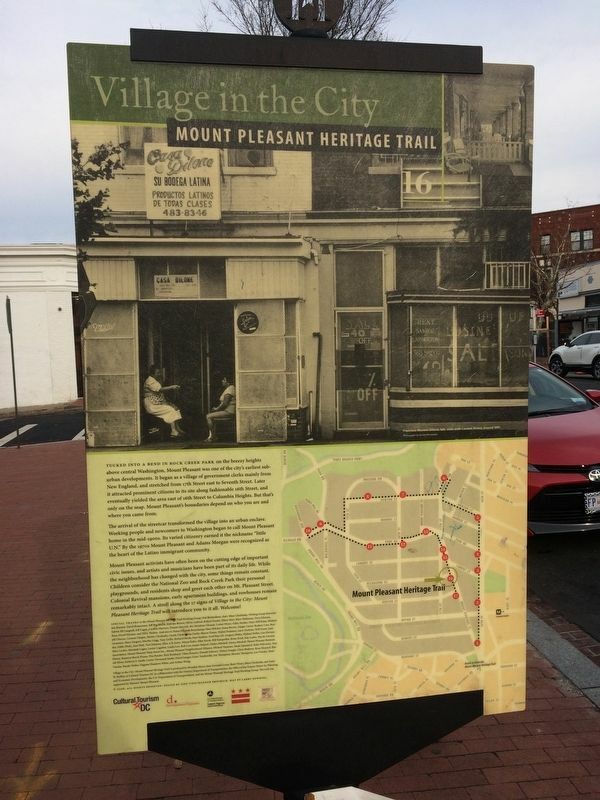 Village in the City: Mount Pleasant Heritage Trail is produced by Brendan Meyer, Jane Freundel Levey, Brett Weary, Mara Cherkasky, and Anne W. Rollins of Cultural Tourism DC in collaboration with the District Department of Transportation, the Office of the Deputy Mayor for Planning and Economic Develoopment, the U.S. Department of Transportation, and the Mount Pleasant Heritage Trail Working Group. The trail was supported by Historic Mount Pleasant. 2006, All rights reserved. Designed by Side View/Hanna Smotrich, Map by Larry Bowring. Marker series. This marker is included in the Mount Pleasant Heritage Trail marker series. Location. 38° 55.838′ N, 77° 2.292′ W. Marker is in Mount Pleasant, District of Columbia, in Washington. Marker is on Mount Pleasant Street Northwest south of Kilbourne Place Northwest. Touch for map. Marker is at or near this postal address: 3153 Mount Pleasant Street Northwest, Washington DC 20010, United States of America. Touch for directions. Other nearby markers. At least 8 other markers are within walking distance of this marker. At Home and Abroad (within shouting distance of this marker); Mount Pleasant Street, ca. 2004 (within shouting distance of this marker); Streetcar Suburb (within shouting distance of this marker); Main Street (about 400 feet away, measured in a direct line); Mount Pleasant Library (about 400 feet away); Sacred Heart Academy (about 600 feet away); Mount Pleasant: The Immigrants' Journey (about 700 feet away); Upheaval and Activism (about 700 feet away). Touch for a list and map of all markers in Mount Pleasant. More. Search the internet for The First Bodega. Credits. This page was last revised on March 21, 2019. This page originally submitted on December 25, 2017, by Devry Becker Jones of Washington, District of Columbia. This page has been viewed 101 times since then and 8 times this year. Last updated on March 8, 2019, by Devry Becker Jones of Washington, District of Columbia. Photos: 1, 2, 3, 4. submitted on December 25, 2017, by Devry Becker Jones of Washington, District of Columbia. • Bill Pfingsten was the editor who published this page.